Curently 70% of our menu is Direct Trade coffee, sourced from our multiple trips to Nicaragua, El Salvador, Costa Rica, Guatemala, Honduras, Panama, Mexico, Colombia, and Brazil. It’s incredibly rewarding to experience the whole coffee journey: from picking all the way to arrival in our warehouse in burlap bags with a big Ladro logo! We take this relationship seriously and are like proud parents when new coffees arrive. Dismas and I traveled to Costa Rica last March and tasted some amazing coffees. One special coffee we chose was from the daughters of Omar Calderon. They started and currently operate Beneficio Granitas de Altura del Ortiz. Their family has won the Cup of Excellence competition in the past and we were excited to have the opportunity to try their coffee. 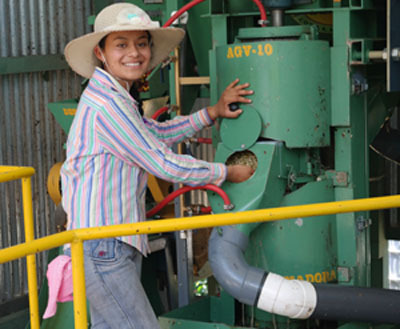 The daughters manage all aspects of Beneficio and their attention to detail stands out in the cup. Dismas and I tasted over one hundred coffees on our trip and this was one of the best. We hope you enjoy this remarkable coffee. Need coffee? Purchase our Granitas de Altura del Ortiz! New Signature Drinks on our menu! Shakerato: lungo espresso shot combined with lots of ice and a teaspoon of raw Turbinado sugar shaken together violently and strained into a small glass. This traditional Italian beverage is lightly sweet and frothy. Gibraltar: a perfectly extracted 19g shot of espresso combined with 2oz of lightly steamed whole milk. Named after the glass it’s served in, this little beverage is basically a bridge between the macchiato and cappuccino. Cold Brew Cooler: cold brew cut with sparkling water and poured over ice. Surprisingly different and refreshing, it’s perfect for a hot day! This entry was posted in Caffe Ladro and tagged Central America, coffee, coffee farm, cold brew cooler, Costa Rica, gibraltar, origin, Robin Williams, shakerato, single origin, specialty, Travel on August 25, 2014 by Caffe Ladro - Ladro Roasting. Seattle, WA — March 11, 2014 — On their recent coffee buying trip, the owners of Caffe Ladro and Zoka Coffee Company delivered a check for $3,000 to the school in Canton Ojo de Agua, El Salvador to build a much-needed soccer field. The idea originated when Jack Kelly and Jeff Babcock visited the region a year ago to taste coffees and trade directly with local farmers. The donation solidified what will be a long association between these Seattle roasters and this community in one of El Salvador’s best coffee growing regions. Kelly and Babcock donating $3,000 to school in El Salvador with the students, teacher and Mayita Mendez of Finca Talnamica. Jack Kelly of Caffe Ladro and Jeff Babcock of Zoka Coffee feel responsible to support the communities that farm the coffees they buy. “When we visit farms, and stay with the owners and workers, we develop lasting friendships with the people who grow our coffee. The experience is powerful,” explained Kelly. Last spring, when they first sold the Natamaya coffee to Seattle customers, the owners agreed to donate a portion of the sales to aide a school associated with that farm. Meeting the children, visiting their one-room schoolhouse and talking with their teacher deeply moved the owners. “Our hearts are full,” wrote Kelly. “This is why Zoka and Caffe Ladro practice Family Direct Trade coffee buying—to help farmers improve their communities,” said Babcock. During the donation celebration, Kelly and Babcock discussed providing school security fencing or solar lanterns for the electricity-free village. The community will make the final decision, and the people are grateful for ongoing support. Jack Kelly and Nena Mendez, the Matriarch of the farm talking with villagers. Coffee farmers in El Salvador face another hardship. Coffee production fell 50% this year due to late rains and a damaging outbreak of Roya (a fungus that causes coffee rust, destroying the season’s harvest on affected trees). Caffe Ladro and Zoka bought coffee from Finca Talnamica that will help offset the effects the fungus had on El Salvador’s harvest. Because of the relationships Kelly and Babcock formed with the people of Finca Talnamica, life in one remote village is improving and Caffe Ladro’s and Zoka Coffee’s customers will enjoy the amazing Natamaya coffee again this spring. For more information about the donation trip and Direct Trade coffee buying, see the story. Caffe Ladro is a coffee roaster with 14 neighborhood cafes in the Seattle area also serving wholesale and online customers. Founded in 1994 and dedicated to profound service, Caffe Ladro provides scratch-baked goods and thoughtfully sourced coffee. Zoka Coffee’s three cafes are mainstays of their Seattle and Kirkland neighborhoods. Pioneering Family Direct Trade Coffee for nearly two decades, Zoka is proud to offer its coffee to its local cafés, wholesale and online customers. This entry was posted in Caffe Ladro and tagged coffee farm, community service, direct trade, donation, El Salvador, Natamaya, origin on March 11, 2014 by Caffe Ladro - Ladro Roasting. Jack and Dismas are on a 10-day coffee buying trip to Central America. These are notes from their journey. Hello, once again from Costa Rica! It’s 7:00 am, Saturday, March 1. We are in the quaint town of San Marcos, high in the mountains of the Tarrazú region, one of the most famous coffee producing regions in Central America. Yesterday, we checked out of our hotel in San Jose and went straight to the lab. Exclusive Coffees has their own first class dry mill where they process and bag for many of the micro mills. Their beautiful lab is approximately 3,000 square feet. Every week, they cup and score all the lots of all the micro mills they work with (a huge task)! In addition, they host buyers like ourselves for daily cuppings. When I walked in the door, I saw a good friend sitting on the reception couch. He’s from Brooklyn and my jaw hit the floor. His name is JD and he has 3 cafes and a small roaster in Brooklyn named Oslo. Small world! We laughed and reminisced for few minutes before getting to work. We cupped two tables of 15 coffees each. This was a big table and a challenge to manage. It took awhile for me to hit my stride but 30 minutes in I felt good. Three coffees on the first table stood out and six on the second. Tomorrow, we’ll bring those into another rotation to be sure they stand up. One particular coffee we loved was a Geisha varietal. Popularized about 10 years ago by the Peterson family of Bochete, Panama, it is now regarded as one of the most unique and demanding varietals. When it’s right, it’s truly amazing. The coffee we cupped was one of those. It tasted sweet, creamy, and very balanced, with notes of orange blossom and jasmine. I only had a few sips but I will remember it for a long time. Wow. Of course, it was not available for sale, only a sample. Maybe next year! After the cupping, we headed for Tarrazú, the most famous coffee producing region of Central America. Tarrazú has over 150 micro mills. We went directly to Don Mayo micro mill, winner 2009 and 2011 COE, as well as many other awards. They are one of the most established mills in all of Costa Rica. One of their unique approaches is picking incredibly ripe cherry–almost too ripe. This creates heavy fruit notes in their washed coffees. Another very cool thing we saw was an extended slow drying process. They built African drying beds, then stacked them about 10 feet high. This slows the drying to 21-plus days which will extend the shelf life of the coffees. Standard centrals last approximately 5 – 6 months. With this slow drying process they expect over a year! By this time, it was very late and dark. We were happy little hotel was close. A quick stop for beers, bar food, and laughs and then to bed. This entry was posted in Caffe Ladro and tagged coffee, Costa Rica, direct trade, origin, Tarrazu, Travel on March 3, 2014 by Caffe Ladro - Ladro Roasting.